Holy/disc priests azerite traits bugged? As of today the azerite values for holy and disc seem to be very different than on days before. For Holy priests many worldquest azerite pieces (of ilvl 370 or 385) show they are better than 415 mythic raid rewards. There are many more similar examples. Also stat weights for disc seem off. The suggestion is to go completely down on haste and buff crit + versatility. All these things don’t add up and it wasn’t like this before. Did you guys do some update in the last 0-48 hrs that might’ve bugged things? I tried clearing cache and different browser but that didn’t work. 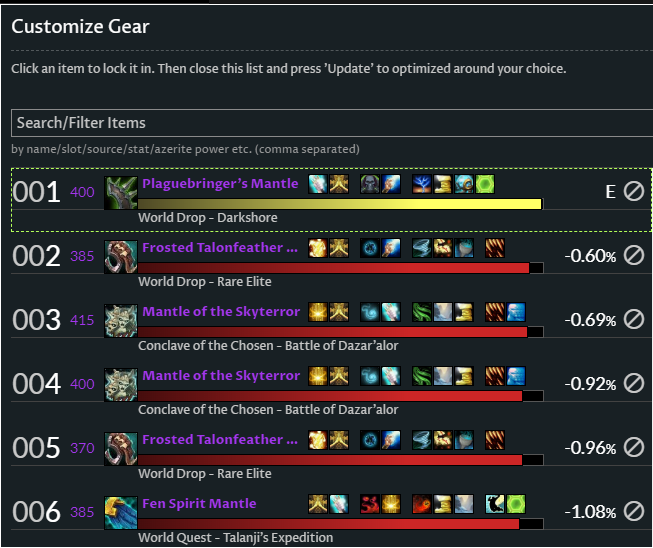 Only change made yesterday was to fix two generic azerite traits that were ranking strangely for a couple healer specs (coming out way too high for certain talent combos). Other than that, nothing was changed that I know of. I think what’s happening to me is that the best in bags-functionality somehow shows me the holy stat weights (mastery > crit build) when i try and optimize as disc. When i do a generic disc profile it shows me the (correct) stat weights centered around haste > crit. Any idea how i resolve this? I’m curious, could you share your AMR string from the addon in game ?